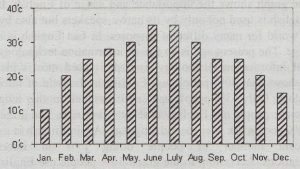 Question: The graph below shows the average temperature of the year 2012 in Bangladesh. Describe the graph in 150 words. You should highlight and summarize the information given in the graph. Answer: The graph shows the variations in temperatures at different months of the year. According to the chart, the lowest temperature is in the month of January, and it is 10-degree centigrade. The highest temperature of the year has been shown in the months of June and July, and it is 38-degree centigrade. The graph shows that there is a gradual rise in temperature from January to June. During this time the temperature varies from 10-degree centigrade to 35-degree centigrade. In June and July, the temperature remains unchanged. But from July the temperature begins to fall gradually and this trend continues till January. However, the similarity of temperatures is noticeable in some months. May and August have almost the same temperature and it is around 30-degree centigrade. Again, April and September have similar temperature and it is more or less 27degree centigrade. Also, the temperature is almost the same in. March and October. Thus, the graph shows the rise and fall of temperature from January to December.